The LA-354 is a 4 channel color LCD display, analog storage oscilloscope. 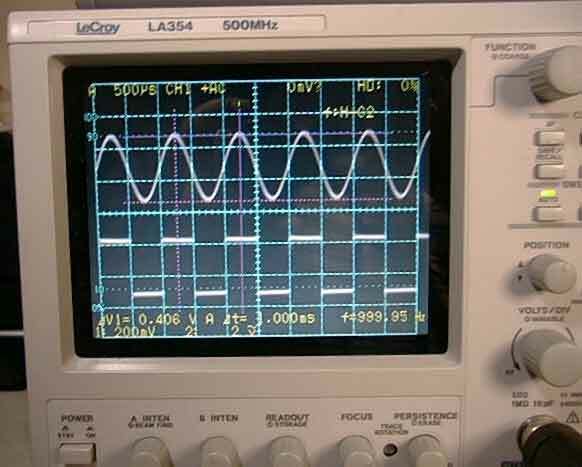 This High-end analog oscilloscope for the digital age has a conservatively rated 500Mhz band width. In the photos below the scope is shown displaying a 1 KHz, 600Mhz and "YES" - it will trigger to around 900mhz with some attenuation. This scope has variable persistence in a choice of colors which is exceptional for glitch capture and single event viewing. 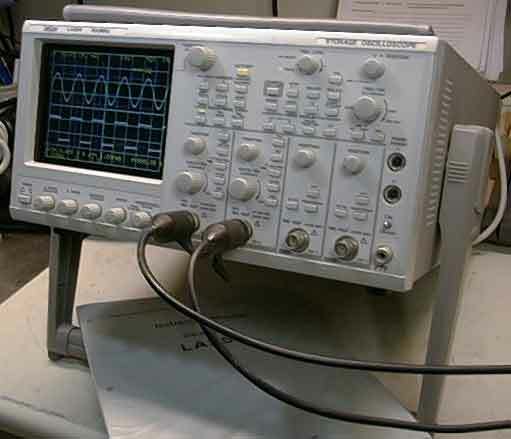 It has a full set range of cursor measurements and built in frequency counter. Look below for more detailed information or visit LeCroy's Web Site. Look around, they have a number of interesting pages relating to features and set up with this scope. Full service for this scope can be obtained through LeCroy. This scope is in mint condition and performs flawlessly. Whether or not you are looking for a great general scope or specifically an analog scope to compliment the digital scopes in you lab, the LeCroy LA354 is the perfect choice. For years, engineer have insisted on oscilloscopes that offer both ultra-high brightness and storage capability in a single unit. Capabilities that until now were only available from digital oscilloscopes. Unfortunately, digital oscilloscopes lack one very important capability -the ability to observe unanticipated waveforms. 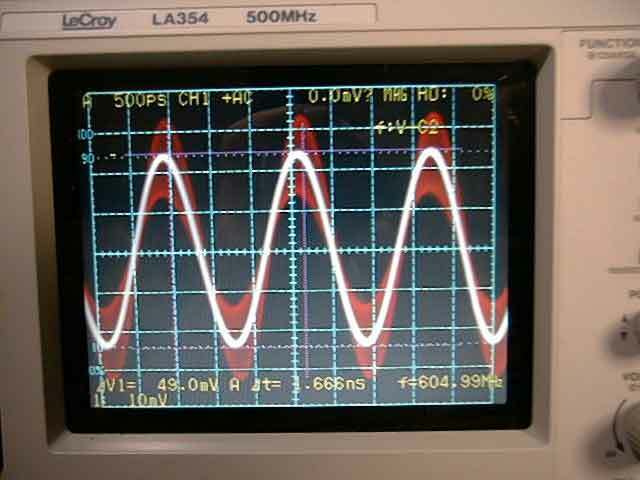 Only analog oscilloscope can do this. 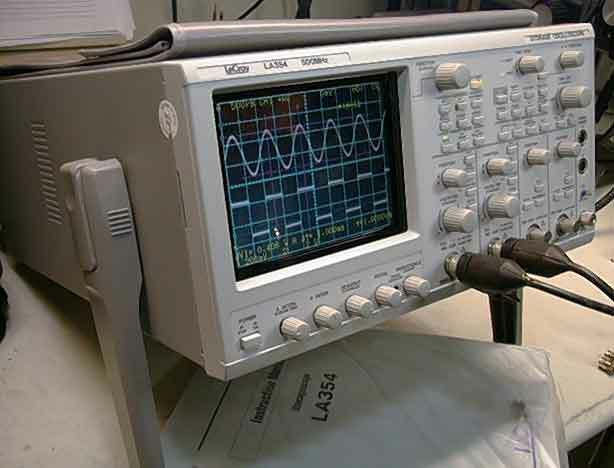 Moreover, both digital and analog scopes have difficulty observing noise waveforms, jitter, and detailed video signal waveforms using delay sweeps. The new LA-354 from LeCroy solve all of these problems. Its ultra-high writing speed and scan converter allow it to capture and store even the most infrequent and irregular signals, providing the ultimate waveform observation tool for researchers and engineers. The scan converter tube is a mechanically reliable and extremely durable high-speed storage tube based on our advanced CRT technology. Featuring a simple design much less complex than that of a conventional CRT used for observation, this scan converter features a CCD (charge-coupled device) that can read waveform information drawn on the screen with a high-speed electron beam directly via an OFP (Optical Fiber Plate). Widest DC to 500MHz is guaranteed at all ranges for all channels. The maximum visual writing speed is 200ps/div. Two independent delay time settings are provided for B sweeps, allowing delay expansion of two signals. Since a CCD is used for waveform storage, waveform images can be easily output to a video printer via the video output. Image data can also be transferred by connecting the scope to a personal computer via video board (optional). 5.5-inch rectangular Color LCD TFT (240V x 320H dots) with variable persistence, electronic graticule (8 x 10 div). Scan Converter Tube: 2 Inch diameter SCT; CCD: approximately 450 x 700 pixel CCD with video RAM. SCT and CCD connected via Optical Fiber Bundle. Rear panel BNC 75 Ohm connection: NTSC Color Composite. Maximum input voltage +400 V max. Save/recall function Number of setups: 256 max. Comments: 12 characters / title. Power consumption: 120 VA max.